One thing is clear when you get involved with Sycamore Land Trust—we are all in this together. Sycamore’s ability to protect the unique and valuable landscapes of southern Indiana depends on the generous support of those who are able to make contributions of funds, land, or time. Memberships at $40 per year are the bedrock of our support, while major gifts of $5,000 or more make the kind of lasting impact that merits further recognition. Over the past year, trees, benches, preserves, and endowments have been named in honor of these donors or their loved ones. It’s one way that we can show our gratitude for the generosity that keeps us moving forward. 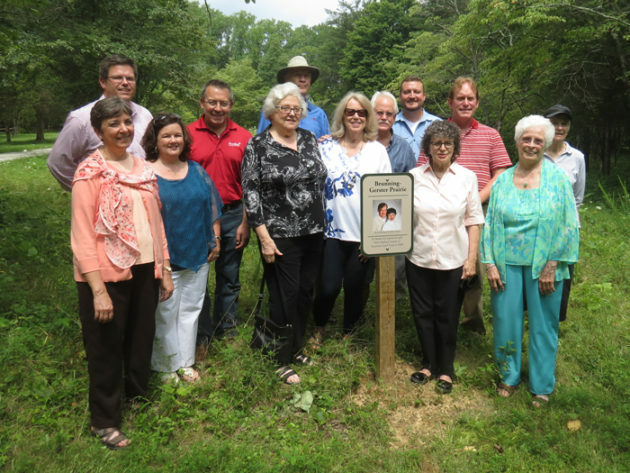 On August 5, we celebrated a very special occasion: the formal dedication of the Brunning-Gerster Prairie Garden at Sycamore’s Cedar Crest headquarters in Bloomington, followed by a reception in honor of donor Darlene Gerster and her family and friends. We asked Darlene to tell us about her connection to Sycamore and what it means to have the Prairie Garden named after her and her late husband, Jerry Brunning. What appeals to you about Sycamore Land Trust? Why did you choose to donate your house to Sycamore? What does it mean to you that the Prairie Garden at Sycamore headquarters will be named for you and your late husband? To learn more about Sycamore Naming Opportunities, please contact me, Ann Connors, at 812-336-6193 x104 or ann@sycamorelandtrust.org. You can also view our Naming Opportunities brochure.